This week we travel to the Czech Republic where freelancer Libor Tělupil will show us a couple of unique sights in Prague and Vlašim. Hello! My name is Libor Tělupil and I’m 30 years old. I’m located in Prague and freshly working as a freelance 3D scanning specialist at my own company VR3D.cz. However, the models I will talk about in this blog were scanned in my previous job at Dimensions Inc. I was interested in 3D since the days when I was in elementary school. At that time, it was the first experiments in 3ds Max and soon after I began to create my own level for Counter-Strike. Although I did not particularly enjoy the game itself, I had a lot more fun creating the level. Unfortunately, as with children of this age is, I never finished it to the end. My first experiments with 3D scanning began about 5 years ago. I started with a cheap webcam, a laser from China for $2, and David Laser Scanner. The initial enthusiasm was great, but quite quickly subsided. 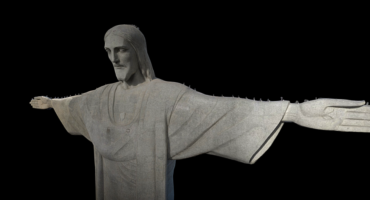 When I found that I was not able to make a model that would have appealed to me alone from such a configuration, I came back to the classic hand sculpting in ZBrush and 3ds Max. Since then, however, much has changed. The last two years I worked in the company that owns the largest full-body scanner in continental Europe, I learned to work with a laser scanner Faro Focus 3D, and now I’m starting my own company dedicated to 3D scanning. This first scan is of a building, which is colloquially called “kuří nožky”, which means chicken legs in Czech. Unfortunately, I have not been able to find the true meaning of this unique structure, however my theory is that the top half of the house was habitable or production (we can see here a small furnace) and the bottom half served as a place for storage of vehicles, tools, etc. This is actually not a real historical building, but only a replica of building from the late 14th and 15th centuries made using the same technical procedures that reflect the time. Its actual age is only less than two years. The building is located in the outdoor museum Řepora in Prague part Řeporyje. It was an unpaid scan, whose main purpose was to get a nice model to expand the portfolio. The scan was taken using a combination of laser scanning with Faro Focus 3D 120 and photogrammetry. In total we made about 25 laser scans and 1000 photographs. The biggest challenge in this scan was correct registering of laser scans so as to be completely accurate. The building has very thin walls made of reeds and even a very small error in the registration of scans led to the formation of holes and various artifacts. The thatch roof was quite confusing to the Faro Scene, so in the first phase some scans were shifted by about a meter. In this open-air museum several fairy tales and serials were filmed. Unfortunately I could not find any, which would show this particular building, but in The Musketeers (S02E05) you can at least catch a glimpse of another building whose scan I also have here on Sketchfab (https://skfb.ly/E78A). Another interesting building is the Chinese pavilion, built between 1775 – 1785. The tower, surrounded by eight stone columns, was previously accessible through a walkway over the bridge from the adjacent tower, which unfortunately does not survive. The Chinese Pavilion is now the oldest pavilion of this type in the Czech Republic. In the arcade you will find beautiful paintings on the walls that recall the sight of an exotic garden. On each pillar seems to grow exotic plants such as palms and fig trees. On the vaulting of the roof then opens up the sky full of birds and butterflies. Also in this case it was the unpaid scan for the portfolio (paid scans are owned by our customers and usually can not be free to publicly displayed). 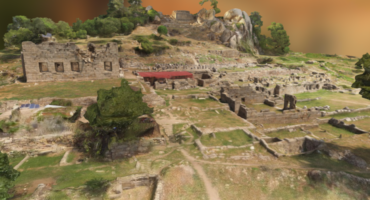 Also this was a combination of laser scanning with Faro Focus 3D 120 and photogrammetry. This time we made about 30 laser scans and 1,100 photos. This scanning was relatively much easier than before, mainly due to the lack of vegetation in the vicinity. The only minor complication was that the building is quite high, and our company was not licensed for commercial flying, so we could not use a drone. This therefore meant that despite the use of 4m tripod,it was not possible to completely scan a certain part of the roof, so I corrected these parts manually in ZBrush and Mudbox. To see more of Libor’s models here on Sketchfab, check out his profile. Some very nice old scans, i was surprised how good the chinese pavilion looks. Quite interesting to find things i would probably never get to see otherwise. Thanks! Yes, these are one of my favorite, it was fun to scan them :).